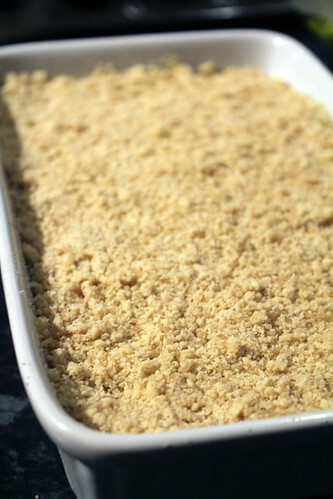 Apple Crumble | Abandon Spoon! My cousin gave me some hand-picked apples when I went to visit her last week- she had two large bins full of cooking apples picked from a friends orchard. I carried as many as I could on the train, and decided that I should make something with them. 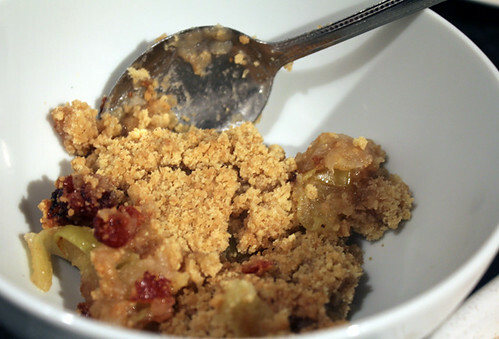 I love a crumble- a classic dish and so yummy. 1. 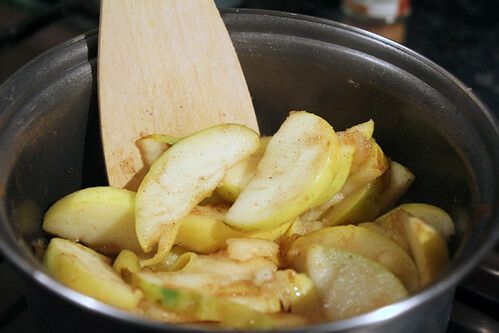 Cut the apples into slices and heat in a saucepan with a couple of tablespoons of liquid (water/ apple juice) and a 2 tablespoons of Sugar and cinnamon. Don’t put the heat up too high and make sure they don’t burn. 2. Once the apples are soft and starting to mush take of the heat. 3. Make to crumble, add flour, demarera sugar and butter into a bowl and using your hands mix together to form a breadcrumb like consistency. Add cinnamon to the crumble as well if you wish. 4. Once the stewed apple has cooled a bit place at the bottom of a dish. Layer the crumble over the top. 5. Bake in the oven for 40-45mins at 180C or until golden brown on top. 6. Serve with double cream. A classic! One of my favourite dishes ever. Try adding sultanas or raisins – they swell up and become extremely juicy. Excellent recipe today thanks for sharing. I really enjoyed reading today’s post.